It’s not too long ago when flat screen monitors were all the rage. In 2017, curved monitors have become the next big thing. According to monitor manufacturers and most of those who’ve used a curved monitor, the wide, curved display surface produces a much more immersive viewing experience, especially when playing video games or watching movies. You may be wondering why most newly released monitors are still flat when the technology behind curved monitors has been around for a while now. Firstly, curved monitors are more expensive to produce. The average price of curved monitors is going down steadily, but it likely won’t ever catch up with the average price of flat monitors. But what’s more important, curved monitors require a very precise viewing angle. Look at a curved monitor slightly from a side, and the viewing experience deteriorates rapidly. This isn’t much of a problem for users of personal computers, but it’s a problem when it comes to living room TVs, monitors in stores and public places, and so on. If you’re set on a curved monitor but aren’t sure which one to get, we have five suggestions for you. All the monitors on this list come from large, reputable manufacturers, and their stellar user ratings are a testament to their quality. The Acer Predator X34 has gaming in its DNA. 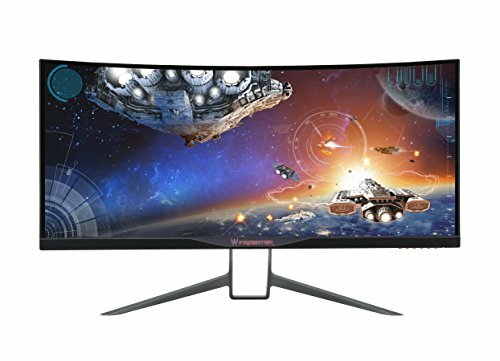 This 34-inch ultra-wide curved monitor with 3440 x 1440 pixels has been designed by gamers for gamers. Its futuristic stand that looks like an alien sentry holds a nearly bezel-less screen, allowing for a wide range of adjustments. Integrated into the bottom bezel is a strip of customizable RGB LEDs that provide ambient backlight to increase immersion and reduce eye strain. If you wanted to, you could place two X34 monitors side by side to game at 10K. The Acer Predator X34 supports Nvidia G-Sync to eliminate screen tearing and the need for software solutions such as V-Sync, which often cause the framerate to drop or make aiming feel unresponsive. With a press of a button, the monitor can be overclocked up to 100 Hz for smoother action, and it’s also just as easy to increase the brightness of dark areas or activate a crosshair. The X34 reproduces 100 percent of the sRGB color gamut, satisfying the needs of professional graphics artists and content creators alike. The monitor can be connected either via DisplayPort or HDMI 1.4. The back-panel houses five USB 3.0 ports, four of which can be used to connect peripherals and storage devices. The Asus ROG Swift PG348Q shares so many similarities with the Acer Predator X34 that the differences between them boil down to design and brand preferences, at least for the most part. 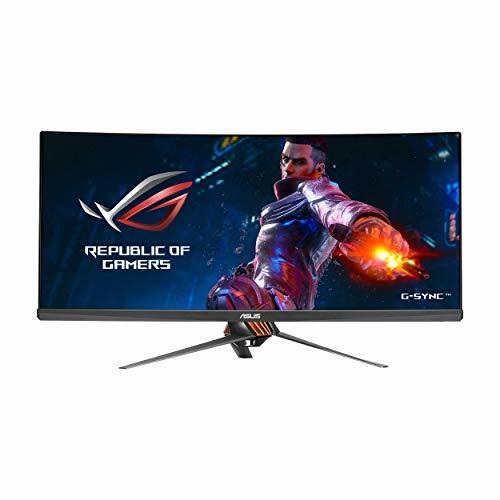 The Asus ROG Swift PG348Q is a 34-incher with 3440 x 1440 pixels and wide viewing angles and color gamut thanks to the IPS display technology. It supports Nvidia G-Sync and up to 100 Hz refresh rates for a fluid, shutter-free gaming experience. 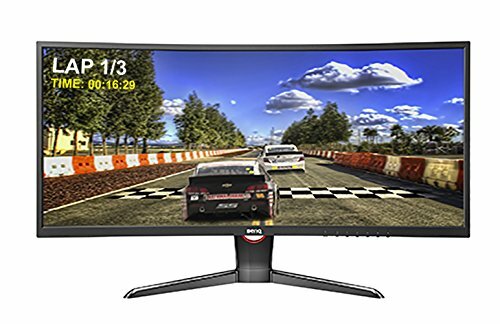 The monitor includes several useful features intended to make long gaming sessions easier on the eyes. Among them is the Asus Ultra-Low Blue Light filter, which reduces the amount of harmful blue light based on your activity, as well as the Asus Flicker-Free technology, which reduces flicker to give you a comfortable gaming experience. The screen stands on an ergonomic stand with swivel, tilt, and height adjustment capabilities. The stand has a built-in LED lighting projection system, which adds ambiance to your gaming. The near absence of bezels around the edges of the display makes it ideal for multi-monitor setups for even greater immersion. Both the Asus ROG Swift PG348Q and the Acer Predator X34 use display panels manufactured by the same company, so the image quality is the also the same. 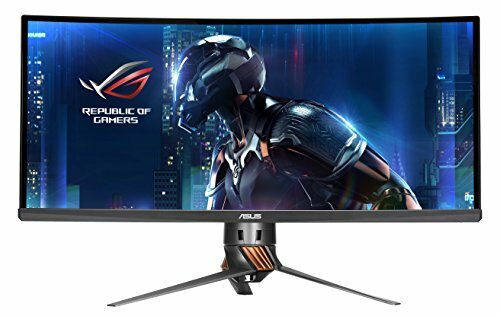 The Asus seems slightly better built, but it could be argued that build quality isn’t terribly important when it comes to computer monitors. Unlike the previous two monitors on this list, the Dell UltraSharp U3415W has a more office-appropriate design and features. It’s still a 34-inch display with 3440 x 1440 pixels, but the gaming features that you get with the Asus ROG Swift PG348Q and the Acer Predator X34 have been replaced by an environmentally-conscious design that relies on eco-conscious materials and enhanced power management. The Dell UltraSharp U3415W features a dual-speaker setup with 18 watts of total power. The speakers aren’t intended for serious music listening, but they’re fine for casual multimedia consumption and general office use. The monitor features fantastic connectivity options, including MHL, HDMI, DisplayPort, Mini DisplayPort, a dedicated audio line, and several USB ports. 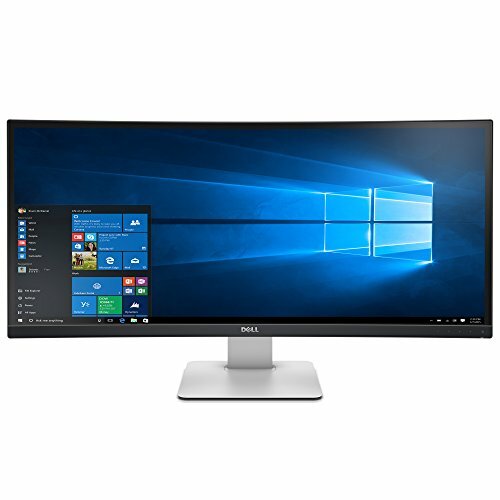 The Dell UltraSharp U3415W has minimal bezels for excellent immersion and seamless extendibility with a second monitor. Dell sells it for around $749, and we think that it’s a wonderful deal for the money regardless of whether you want to use it for gaming or for office work. The BenQ XR3501 is an affordable curved gaming monitor with some compromises but even more great features. Being a 35-inch monitor, the biggest compromise that BenQ had to make when designing this monitor is the relatively low resolution of 2560 x 1080 pixels. Depending on how close to the monitor you sit, you may be able to see individual pixels even when not looking for them, which can be distracting and possibly immersion-breaking. This problem isn’t all that noticeable when gaming because of all the fast action, but switch to a web browser or a word processor and the individual pixels really jump out. The lower resolution is to a large extent redeemed by the support for up to 144 Hz refresh rates, which ensures crisp, fluid motion. Together with the large field of view, the XR3501 can really make games come to life. Like more expensive gaming monitors, the BenQ XR3501 is packed with useful gaming features, such as its twenty levels of color vibrance, the built-in Black eQualizer color engine technology to brighten dark scenes without over-exposing the bright areas, or BenQ’s new Low Blue Light technology, which effectively reduces eye fatigue by eliminating harmful blue light. The monitor even supports a picture-in-picture and picture-by-picture display modes. With them, you can display images from two different input sources on a single monitor. For around $600, the BenQ XR3501 is a great choice for gamers on a budget or those who’d like to put together a multi-monitor setup without spending thousands of dollars. 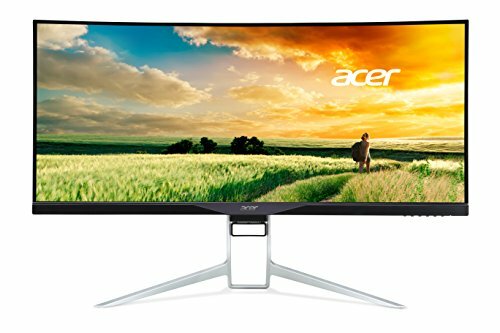 Acer’s competitively-priced, curved, the gaming-ready XR341CK monitor has a 34-inch screen with 3440 x 1440 pixels and low response time of 4 ms. The monitor can go up to 75 Hz, and its LED backlighting ensures even colors and brightness from corner to corner. Designed with both entertainment and productivity in mind, the Acer XR341CK covers 100 percent of the sRGB color gamut, and it features Acer’s 6-axis color adjustment the highest standard of color accuracy. The color accuracy of the monitor doesn’t deteriorate even when viewed from very sharp angles. Being the multimedia powerhouse that the XR341CK is, it comes with two built-in 7 W DTS Sound speakers and EyeProtect’s Flicker-less and Blue-light filtering technology. 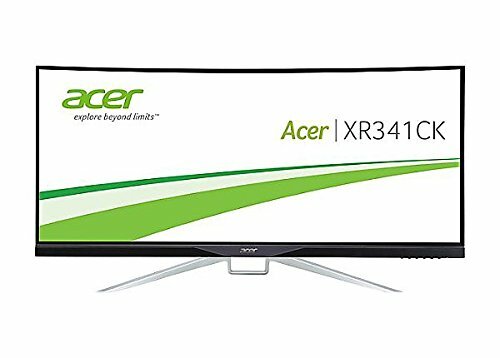 Together with AMD Freesync for a smooth, tear-free experience, the Acer XR341CK is a great monitor for anyone who enjoys an intense gaming session or a TV show binge after work or school. What gives the Acer XR341CK an edge over many other gaming monitors is the support for two sources displayed side-by-side in one screen. You can connect your PC or laptop either via HDMI or DisplayPort, and you’ll also get five high-speed USB 3.0 ports for your accessories and peripherals.